Today I will happily write about something I know nothing about: graphic design. What I lack in traditional graphic design schooling I hope to make up with my knowledge of Sweet Basic Lands. Wizards has released full-art lands with three different sets: Unglued, Unhinged, and Zendikar. All of them were received extremely well, and both the Unglued and Unhinged lands started selling for more individually than the packs retailed for, which was quite the accomplishment as there was one in every pack. Zendikar’s basic lands got more attention than almost anything else in the set, save for maybe the return of fetchlands and the rarity of Lotus Cobra. Even when the set was being opened en masse and the full-art lands were everywhere, people were constantly haggling over them and trading for the ones with the art they liked the most. It’s one of the very few times that Magic players seemed to care about the aesthetics of their cards, rather than just using the shiniest/rarest/most expensive versions whenever they could. Wizards was understandably pleased with the warm reception, and made sure to make clear that the full-art lands were a special thing for Zendikar, and would not be in every set, but that they would come back at some point. That was five years ago, and every set since then has had normal, boring, same-old normal-frame lands. 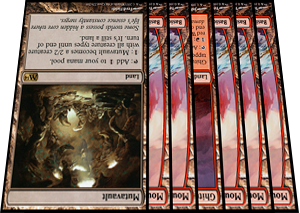 Full-art lands should not be a once-every-five-or-six-years thing. They should be on every basic land, every time. They make learning the game easier. I’ve taught the game to a bunch of people. One of the standard steps is explaining what lands are, why they are important, and that, after they untap and draw, they should check to see if they have a land to play. In these early games, the only lands in the decks are basics. 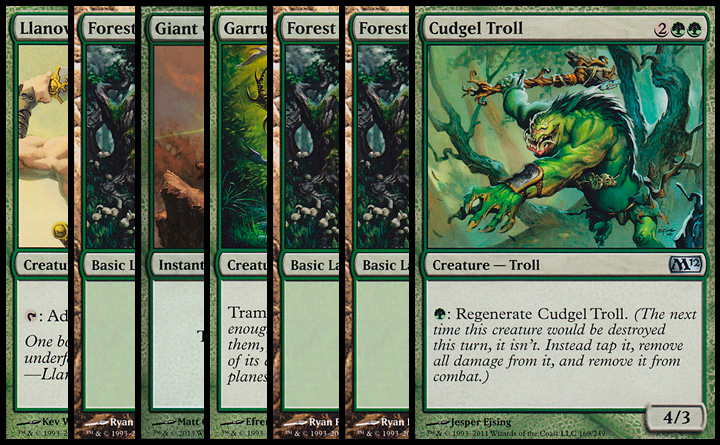 Full-art lands make it very easy to tell the difference between lands and spells, because they really stand out. Could you pick out what the land is, without assistance from the person teaching you? Maybe. You could look at the name of the card. The shading is slightly different. 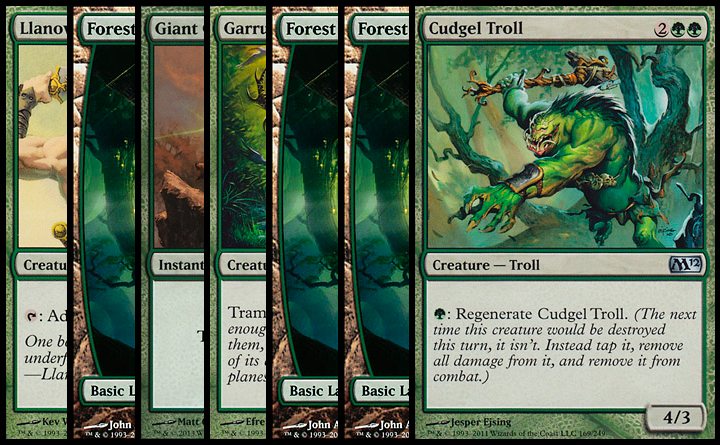 There are some subtle aesthetic differences that distinguish the basic land from the spells. Let’s not play around, here. I was making those images, and even I wasn’t prepared for the night-and-day difference in how much clearer it is to use Zendikar basics. The benefits to new players would be enormous if all basic lands were full-art: they would instantly be able to recognize which of their cards were basics. This might be a small thing, but it’s a very, very important one. Acquisition is every bit as important as Wizards keeps telling us it is, and acquisition doesn’t just mean changing marketing strategies. It means changing the game visually to make it look better and cleaner. Way back when, Portal came out, introducing the “big mana symbol in text box” look to make the lands stand out more to new players. They then realized that the same concepts applied to the lands in every set, so they made it the default. Now it’s time for the next logical step. They make looking at the board state easier. This works exactly the same as above, except this time, it’s with experienced players. You’re moseying along against some awful mono-red deck playing terrible cards, and you are paying attention to the creatures in play and the cards in hand and what each person might draw and the life totals and the time left in the round and how his Mutavault affects the race, and you’re fine with him blocking with Mutavault, so you attack, and… oh, hell. Now, instead, imagine that everyone instead uses exclusively full-art basics. A lot clearer, isn’t it? Here’s the last one, and it’s a big one. People absolutely love full-art lands. People like looking at Magic art, and the cool art featured on cards can even be a reason that people decide to take a closer look at the game. If every basic land had that amazing full-art frame, that would be a lot more cards devoted to showing off the high quality of modern Magic art to people that don’t play. There’s a reason that, five years since Zendikar was printed, people are still trading for, buying, and playing with non-foil versions of them every chance they can get. The set sold a lot, and there was a full-art basic land in every single pack, and still people pay $1-$2 per land to use in every deck they have, or hundreds of lands for their Cubes. 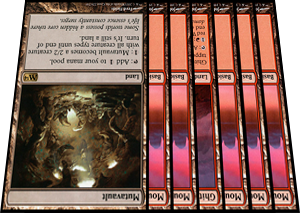 People want to use the full-art lands all the time, and Wizards disagrees. Their reasoning is pretty bad to now print them more often, usually along the lines of how they want them to be special and a big deal when they appear. But things don’t have to come every six years for people to enjoy them: people like Dragons, and Angels, and fun draft environments, and Terese Nielsen art, and they make sure those happen more often than once every six years. Sure, they wouldn’t be unique if every set had full-art lands, but is a lack of uniqueness really so bad? They would replace a mediocre-looking thing with a cool-looking one, therefore making Magic an overall more aesthetically pleasing, easier-to-learn, and overall more attractive game. Print full-art basic lands. Every basic, every set. If people don’t like them, there have been two dozen years of non-full-art lands to choose from. I’ll probably stick with Portal Three Kingdoms basics, myself.